You want to make kefir… yet right off the bat, you've got a decision to make… which starter to use? You see, you can use kefir grains or a kefir powder as your starter. Uh-oh. All of a sudden, the kefir that everyone says is so easy just got complicated! Which is better? Which is healthier? 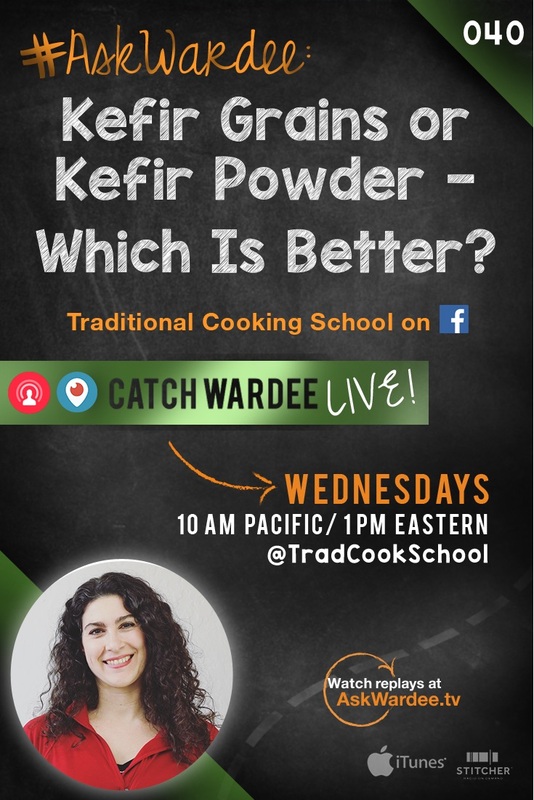 “Which is better — kefir grains or kefir powder?” asks Jen on today's #AskWardee. I'm sharing my thoughts below! Hello! My questions is in regard to kefir. I make my own kefir with a freeze-dried kefir starter. Once I had my first batch completed, I make my ongoing kefir out of my previous batch. What about using the kefir grains instead. Is there a health or nutritional benefit with using the grains versus the freeze-dried powder? Thank you in advance for your response! First let's talk about what dairy kefir is, and I'll tell you about the starter cultures (kefir grains vs kefir powder). Then we'll get to what's better overall. Kefir is a fermented dairy that's similar to yogurt, except the mother culture is both beneficial bacteria and yeast. Yogurt is just beneficial bacteria. The end result is thinner, more sour, and even a bit effervescent or bubbly, due to the organisms producing more gas as they culture the milk. You can make kefir with raw or pasteurized milk. It's easier than yogurt, really. Simply plop your culture (either grains or powder) into a bit of milk, cover your jar, and let it culture at room temperature for 24 to 48 hours (adjusting up or down depending on the season of the year, temperature of your house, etc.). I don't want to get too complicated, as there are nuances even with what I just described. We're going to keep it simple and focus on the kefir grains vs. kefir powder. Kefir grains are the mother culture for making kefir. They are soft and rubbery and look a lot like clumps of cauliflower. You put them in milk and pull them out, and can reuse them over and over again. They also grow (some do, some don't, it depends on the milk and conditions)… so you can share with friends or make more with your extra grains. What's in the grains, though? The beneficial yeasts and bacteria! They live in that matrix that is like rubbery cauliflower. And when plopped into milk (or coconut milk), they eat the lactose in milk and in exchange create the thickened, curdled, sour, bubbly milk we call kefir! Kefir is full of probiotics and beneficial acids. It also has less lactose (milk sugar) than milk… the longer it ferments, the more lactose is consumed. These grains contain at least 30 beneficial strains of bacteria and yeast, making them a true probiotic power house! Kefir powder is a freeze-dried culture of 7 to 9 strains of beneficial bacteria and yeasts in powder form. You mix it with your milk (or coconut milk), and it creates kefir. The resulting kefir can be used to make new batches, but not indefinitely. So Which Is Better? Kefir Grains or Kefir Powder? For 2 main reasons, I believe the kefir grains are better than the powder. Second, the grains can be used over and over again, while the powder will need to be purchased again. You can stretch that out by using a small amount of powder, then culturing with finished kefir for several batches — but it won't last forever, like kefir grains can. This doesn't mean there aren't benefits of using powdered kefir starter. It can be more convenient. Just add powder. No straining out of the grains when you're done, and certainly no having to take care of the grains if you want to take a break from making kefir. So that's my answer. I'll have links below for you to get more information about kefir and more ideas to use it, too! Also… be sure to grab my free thick raw milk yogurt recipe that I just made available. Thick raw milk yogurt IS possible with 1 special ingredient! 🙂 Go here to get the free recipe. Our preferred source for cultures such as kefir — grains or powder — is Cultures for Health. TCS members, you can save 10% to 15% off your cultures and supplies if you use the coupon code you'll find in the private member area! So how do you make kefir? Kefir grains or kefir powder? I am a four month user and find my kefir grains to be fabulous. I use raw goat milk and a small kefir clump gives me about 8 oz. of kefir a day. When he grains birth more (frequently), I gently chew and swallow the extra trusting their ability to do good things while going through the gut. I never rinse the kefir gains anymore and either just add more milk after drinking the kefir, or if the glass (pint Bell jar) is asking to be washed, transfer the grains to a new jar. This has worked super well so far. The longest I’ve left the grains is two weeks for a trip and put it with fresh milk in the fridge. Kefir was part thick and part alcohlish when I returned, and the grains were good to go.